How To Make Money by Selling Your Clothes! 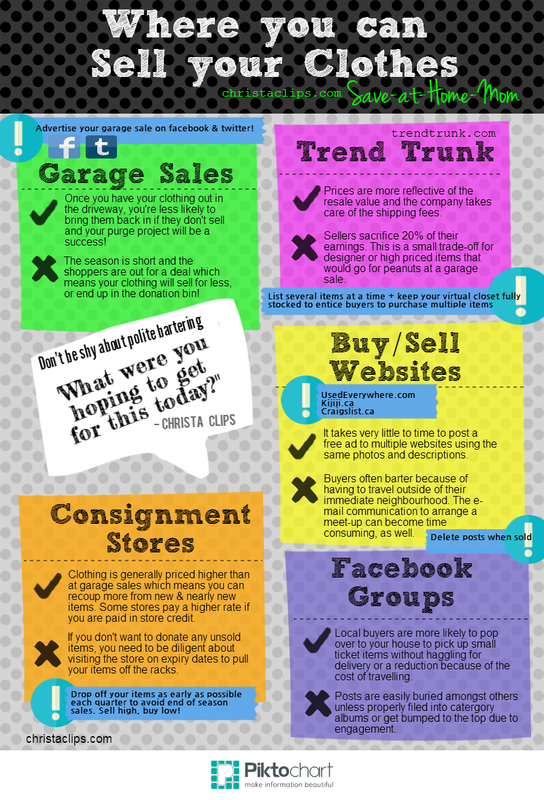 Christa Clips: Save-at-Home Mom shares her top 5 ways to sell used clothing! Garage Sales. Tip: hang your clothes with a shower rod and step ladders instead of folding them on a table otherwise you’ll be refolding all morning long! Remember that “garage sailors” are out for a deal. Don’t expect top dollar even for high value items. Need plastic hangers? Ask customer service at a local department or clothing store: they throw out bag fulls every day! Local Facebook Buy & Sell Groups. Tip: buyers are more likely to arrange a meet-up for multiple items so post pictures or collages with many items. Again, folks are looking for bargains on these groups so be reasonable when setting your price otherwise people will ignore all of your future posts. Local Buy & Sell Websites – UsedEverywhere.com, Kijiji.ca, Craig’s List,etc. Tip: create an e-mail address specifically for online sales so that your personal inbox doesn’t get flooded! If you’re concerned about privacy & safety at the meet-up, use a fake name and meet at a public location. Trend Trunk – post pictures of your clothes and once an items sells, Trend Trunk sends you a pre-paid postage envelope to mail it to the buyer. You’re paid 80% of the selling price online by Trend Trunk and you can cash out your earnings, shop the site, donate your sales to charity. This site is especially useful if you want to find potential buyers beyond your local neighbourhood and garage sale looky-lous: buyers who will be more willing to pay closer to the resale value of your designer and higher value clothes. Tip: find a consistent backdrop for all of your photos to keep your “closet” looking tidy! Consignment – call ahead to the store to find out what season is being accepted and how many items you’re permitted to bring in each trip. Tip: try to get your seasonal items in at the beginning of each season so that you increase the odds of your items selling at full price before the “end of season sales” hit! Sell high, buy low! If you’re going to the trouble to consign your clothing, post an online ad, meet-up with a potential buyer, or ship your used clothing in the mail, it really is worth your time to spend a few extra minutes to make sure your clothing is at it’s best and can therefore fetch a better price. Launder and iron if necessary to get rid of all wrinkles, including the tag! Nothing says “old and worn” like a rolled up tag! Take a clear picture of your clothing either on a hanger or on a headless/faceless model. Despite their appeal as flat surfaces, the floor and bed are the two most unappealing places to stage a photo of clothing that you hope someone else wants to buy from you. Describe the condition of the clothing. E.g. New with Tags, Never Worn, Like New, Excellent Condition, Good Condition, or Well Loved! Include the price. When in doubt, err on the low end to entice people to check out your other ads for more great deals! Selling your clothing when you’re finished with it is a great way to recover some of the money you spent in the first place, and help offset the cost of updating your wardrobe each season. Please drop a line in the comments below if you have other favourite ways to sell your used clothing – I love hearing about all of your savvy tips, too! Posted on April 15, 2014, in Budget Hacks, Christa Clips and tagged Budget Hacks, Christa Clips, How to Sell Used Clothing, Trend Trunk. Bookmark the permalink. 2 Comments.